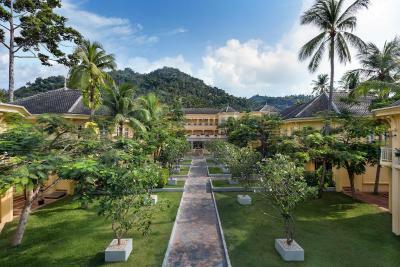 Lock in a great price for Manathai Koh Samui - rated 8.3 by recent guests. Good breakfast. Nice swimming pools.Friendly staff. The hotel is very good and have good facilites and good wifi. The pools are beautiful. Breakfast was nice, room was nice, staff were great. The breakfast was really nice. Lots to choose from. Continental, English Breakfast, Thai and Chinese Dishes. Eggs made to order. Real coffee so this was great. Swimming pools were clean and nice to be in. Pizza tasted great. We got two bottles of water free everyday. located inbetween a Family Mart and 7Eleven. Great Thai Restaurants not too far away that are great value for money. Lovely hotel, grand rooms, pool is great and it has its own mini beach next to the pool. There is also an area next to the pool which is laptop friendly should you need to work. Delicious buffet breakfast. Really friendly staff. ATM, supermarket and pedestrian crosswalk all very close. Lots of food options nearby. On a beautiful beach. Will stay again! Nice dining area, comfortable beds, proper room, fair staff. Loved the dining lady every morning, they were so handsome. The room was excellent, they even let me have a ground room. Very understanding and friendly staff and management. The pool was nice, and the food was great - both at breakfast and at the pool restaurant. The room was nice and quiet - once we changed rooms - and the bed was comfortable and the room was a good size. The hotel is 4.7 miles from Elephant Trekking, 1.8 miles from Grandfather and Grandmother stone and 4.6 miles from Namuang Waterfall. Samui Airport is 5.6 miles away. On-site parking is possible. 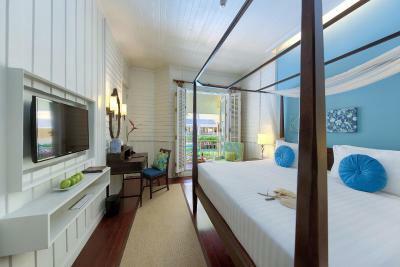 Rooms here will provide guests with air conditioning, a balcony and a minibar. Featuring a shower, private bathrooms also come with a hairdryer and a bathrobe. Extras include a satellite/cable TV. 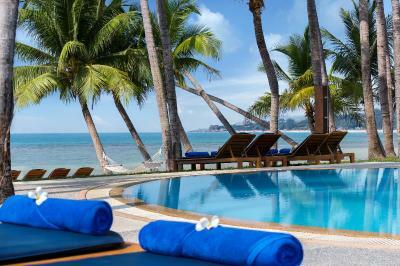 At Manathai Koh Samui guests will find a restaurant with Thai cuisine. Other facilities offered include a ticket service, a tour desk and luggage storage. An array of activities can be enjoyed on site or in the surroundings, including cycling, diving and snorkelling. This is our guests' favourite part of Lamai, according to independent reviews. 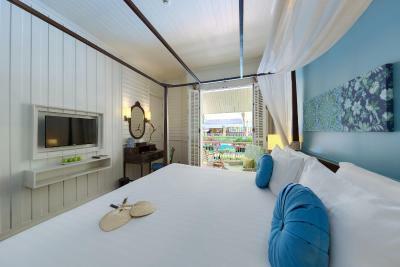 Manathai Koh Samui has been welcoming Booking.com guests since 20 Aug 2010. 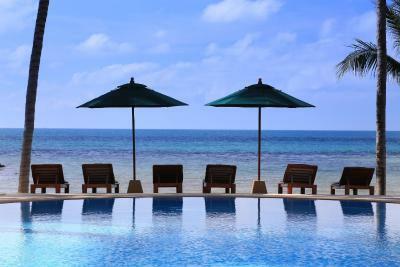 When would you like to stay at Manathai Koh Samui? Features 2 flat-screen TVs, a separate living area, walk-in wardrobe, marble bathroom with bathtub and shower area. It has a wooden four-poster bed. 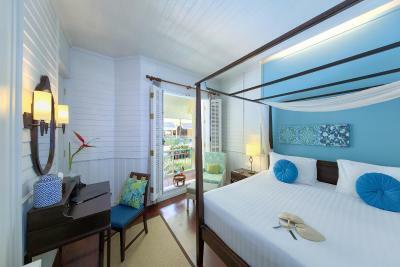 This spacious colonial and oriental style suite features a large balcony, a walk-in wardrobe and a separate living room. A DVD player and flat-screen TV are included. 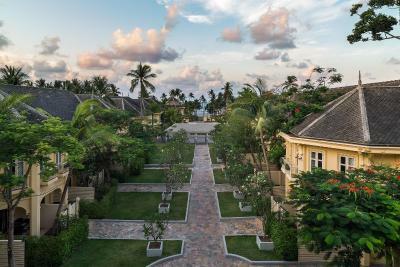 This room features traditional Thai architectural elements fused with colonial touches. It offers a four-poster bed, French doors, a marble bathroom and a private door overlooking the garden. Offering 2 bedrooms, this spacious and colonial-inspired suite features a kitchenette, a private balcony and a cable/satellite TV. Free toiletries, a hairdryer and a bathrobe are included in a private bathroom. This room has sliding doors which open up to a patio by the garden. This family room has a private entrance, flat-screen TV and bathrobe. This family room features a DVD player, seating area and electric kettle. 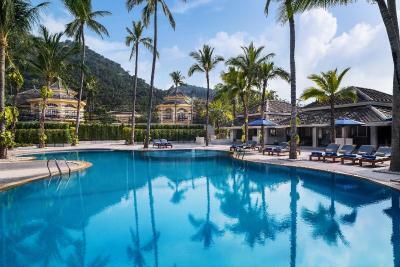 Colonial style of building, large hotel area 2 swimming pools, Waterline is restaurant and pool with ocean view. Padthai is serve signature Thai dish. Mulligans is pub Irish style.is well know place on lamai beach. House rules Manathai Koh Samui takes special requests - add in the next step! Manathai Koh Samui accepts these cards and reserves the right to temporarily hold an amount prior to arrival. Please note that guest’s have to present the same credit card which has been used to make a reservation and settle the payment. And the name of the credit card holder must be the same as the guest’s name. If the guest is unable to present the credit card upon check-in, hotel’s right to make a new payment. Small room small balcony.No facilities ie pool table or any games for big hotel. Noisy breakfast with Chinese guests not controling children. Pool next to beach rough edges kids get scratched many times and yet staff don’t have a simple bandage.Lucky for seven eleven next door. Clean and comfortable room and good breakfast. Beach is terrible, don’t expect to swim in the sea nearby. Hotel is quite far from restaurant and entertainments. Having a car or a bike would solve those problem, however not everyone wants to ride to the beach and back with no shower and facilities. Crystal bay beach is very nice option to go, 10 min ride on motorbike. Quite, excellent friendly staff and clean comfortable room. Pool is wonderful. Their staff was amazing but it seemed like they didn’t know where the local hotspots were when I asked them to call a taxi after showing them on google map. I felt like they were clueless for directions. They also need to extend their restaurant hours into the late night. They closed at 7!! Others we’re open until 1 or 2am. WiFi was terrible, Beach was not clean and good as expected. Stuff was friendly, nice rooms, breakfast was good. The breakfast is too expensive, not worse it. They didn't say not to take food outside the breakfast area, just gave a huge bill! Didn't help to solve the problem! Reception staff seemed pleasant but overworked. Beach in front of hotel was not as nice as we expected, a bit of pollution and murky water. Not the beach that is maintained by the property. That is nice. The public beach. Stayed there for a little over a week & the price was extremely reasonable & very cheap for a 4 star hotel. The staff were very helpful & responsible. The AC & lights went off in my room 1 night & they immediately sent a technician & staff member to fix the problem of the electricity & so. 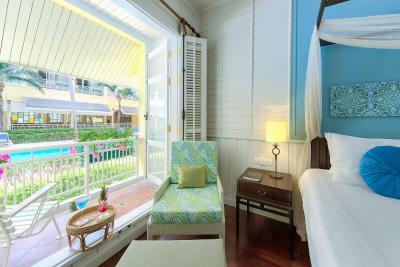 The balcony is comfy & the deluxe double room wasn't too big or too small but just right for a 1 person stay. Extremely good value & will recommend anyone I know to stay here. Busy road road between hotel and pool/gym area. Place is out of Lamai centre, no prpper pedestrian walkway next to busy road. Jacuzzi in hotel side, breakfast, guy helping people over road. Only small capsule of shower gel provided for two people.